The Huskies' Pac-12 opener suddenly has make-or-break implications for the their College Football Playoff hopes. SALT LAKE CITY — And you thought Auburn was a big game. The No. 10 Huskies are back on the road this weekend for their Pac-12 Conference opener against Utah, a game that suddenly has make-or-break implications for the Huskies’ College Football Playoff hopes. The 21-16 loss to then-No. 9 Auburn two weeks ago in Atlanta leaves the Huskies with almost no margin for error when it comes to the playoff discussion, and they’re hardly easing into conference play. The Utes (2-0), who fell just outside The Associated Press Top 25 poll this week (they’re No. 26), are expected to be one of the top challengers in the Pac-12 South this season. They are expecting their 53rd consecutive sellout for the 7 p.m. PT kickoff Saturday at Rice-Eccles Stadium. The game will air on ESPN. As part of a black-out theme, Utah will wear black uniforms and has asked fans to wear black too. The Huskies have won their past two Pac-12 openers, both on the road: at Arizona in overtime in 2016; and at Colorado in 2017. ESPN’s “College GameDay” was on the Utah campus two years ago when the Huskies last visited Salt Lake City. 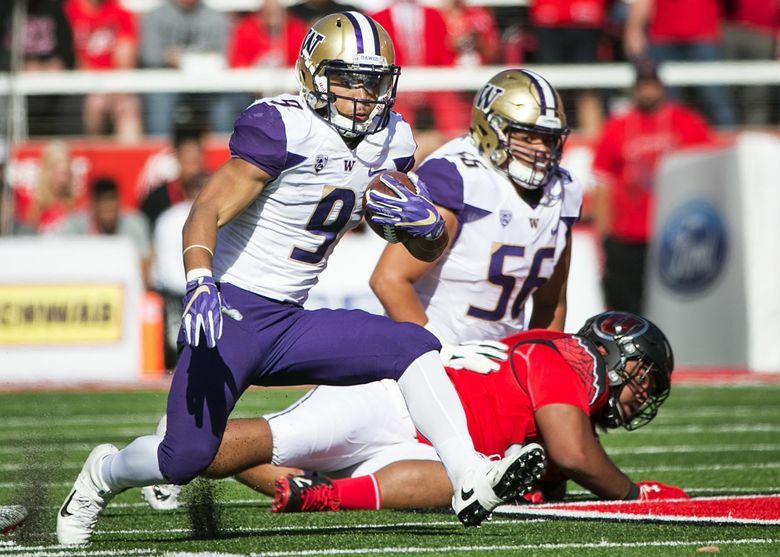 Dante Pettis’ late punt-return touchdown gave the No. 4 Huskies a 31-24 victory over No. 17 Utah that day. “We can stand toe-to-toe with them and play with them, and that is something that should give us some confidence,” Utah coach Kyle Whittingham said. Washington and Utah have two of the Pac-12’s top defenses. Both have been inconsistent on offense in their first two games. The Huskies, in particular, would like to see better production out of their run game. Petersen said that has to start with better blocking from the reshuffled offensive line, which will be without senior left tackle Trey Adams (back surgery) for some time and could again be without junior center Nick Harris (undisclosed injury). Petersen didn’t offer a concrete update on Harris’ status this week. In the Huskies’ rout of lower-division North Dakota last Saturday, Petersen said the running game was “stumbling over ourselves too many times.” That can’t continue into Pac-12 play, he said. “We better get it figured out, because this is a significantly different (and) better run defense than we’ve seen,” he said.